The Anilla Cultural Latinoamérica-Europa in Uruguay, a network of cultural facilities, coproduces online events using second-generation Internet technologies and promotes both research on new uses of the Internet in cultural production and the exchange of content. 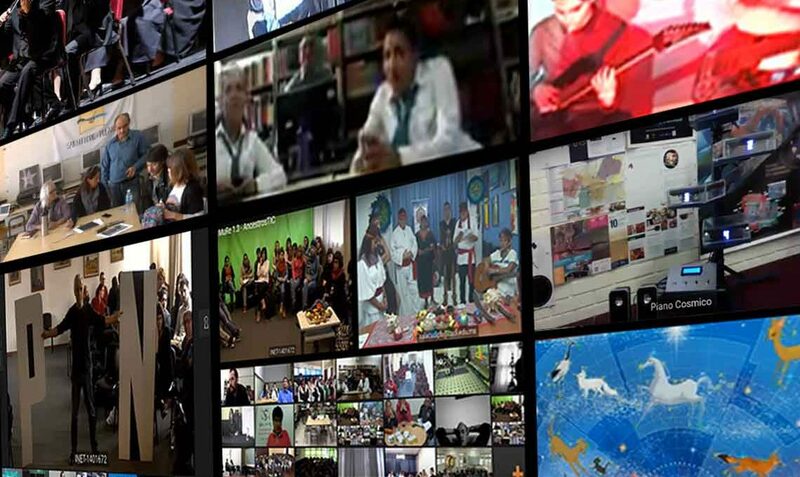 By helping creative initiatives experiment with new digital applications and improve dissemination and intercommunication, Anilla Cultural creates innovative synergies between different technical working groups on an international level, with multiple interconnected video conferencing rooms, exchange of interactive content, simultaneous interpretation in several languages, interoperability between different systems and platforms, expansion of broadcasts on various social networks and more. NRENs play a central role in making this happen. For example, the “MuRe” Museography in Network project, led by Anilla Cultural, is attached to RAU2, Uruguay’s NREN and supported by RENATA, RedCUDI, REUNA and RedCLARA. This project connects 50 VC rooms in Colombia, Mexico, Argentina, Peru, Chile, Paraguay, Spain and Uruguay to develop cooperative creation strategies for building real-time storytelling integrating countries, people, museums and objects. The exciting field of cultural convergence coupled with advanced networks is generating a real-time, advanced Internet circuit that features stories of heritage, dialogues and interaction with the public. Participants create exhibitions that only exist on the Internet. Participating institutions and audiences do not geographically coexist, but share the same virtual time and space. Collaborations such as these have been made possible thanks to an innovative videoconferencing platform, VC-CUDI platform, developed by the CUDI, the national research and education network of Mexico. “In Uruguay, we have used VC-CUDI for many years with excellent results. We have managed to generate synergies between different technical working groups, simultaneous interpretation in several languages, interoperability between different systems and platforms, expansion of broadcasts on various social networks,” says Delma Rodríguez, Director of Anilla Cultural Latinoamérica-Europa. Another important Anilla Cultural Latinoamérica-Europa project leveraged the VC-CUDI to empower the “Friends of the CERN Network in Latin America.” This enables virtual visits to CERN for different regions in Latin America. Using the Internet, enthusiasm and emotion overcome geographical distances between people in Latin America and state-of-the-art particle physics research going on in Geneva. The initial visit enjoyed massive attendance and the first-class link enabled sharing scientific content as well as direct talks to engage the audience in discussions on the latest scientific advances. The VC-CUDI platform was also a key enabler to the 1st International Colloquium on e-Science and e-Art organized by RedCLARA. The Chilean National Research and Education Network, REUNA, uses the service to conduct streaming sessions via Facebook and YouTube. “This collaboration service was very well received and used by REUNA,” says Beatriz Contreras, REUNA Services Assistant. “The tool is compatible with our own systems, such as the MCU (H323 equipment only) and PLAZA, a platform similar to VC-CUDI. The VC-CUDI system, developed and maintained by CUDI, the Mexican NREN, is making cooperation more intuitive and easier all across Latin America… and beyond. This collaboration between networks has demonstrated the power of networking technology in research, education and the dissemination of science. The Virtual Rooms of the videoconferencing system allow users to connect through Advanced Networks and the Internet. VC-CUDI is also compatible with CODEC’s, computers, phones and tablets, supporting full connectivity with platforms such as Webex, Scopia, Skype for Enterprise, ACANO and Vidyo, to name just a few. Users can share desktops through Google Chrome, Firefox and PEXIP applications. The VC-CUDI platform has made important inroads in 2017 by fostering cooperation and collaboration among NRENS. Over a ten-month period, 325 international meetings were held via VC-CUDI, using 3,289 connections and 661 hours of active sessions. In addition, VC-CUDI supported 48 sessions of live transmission via YouTube, which translates into over 95 hours of video and 11,587 views (as of September 2017).